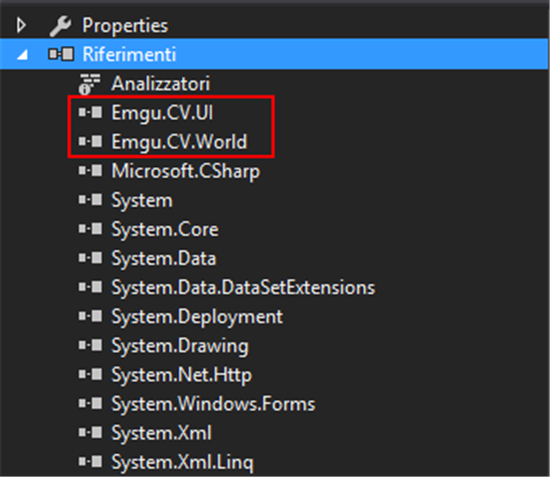 In the following we'll see how to realize an image recognition program, using C# and EmGu, a .NET wrapper for the Intel OpenCV image-processing library. At the end of the article, the reader will be able to develop a simple application which will search into a list of images for the one containing a smaller portion of the original one, graphically showing the points of intersection between the two. 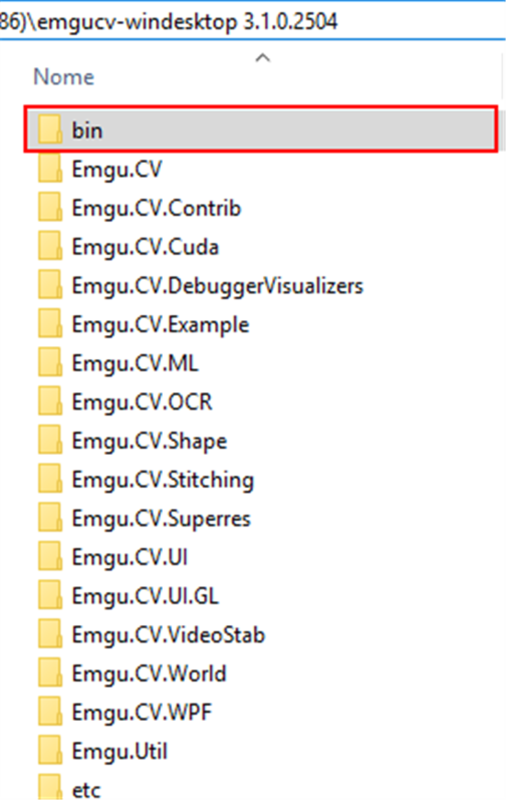 EmGu libraries can be downloaded at https://sourceforge.net/projects/emgucv/files/. The latest version of the package is located at https://sourceforge.net/projects/emgucv/files/latest/download"source=files, and comes in the form of an exe installer. For a pretty complete reference of the library, the reader is invited to visithttp://www.emgu.com/wiki/index.php/Main_Page , which is the official Wiki of EmGu. Here will be considered only the indispensable aspects and functions to reach the declared goal of matching two images to find the smaller one in a list of possible candidates. Once downloaded, the package can be installed in a folder of choice. Upon completion, the install folder will appear like the following, with the \bin folder containing the core components of the package, i.e. the DLLs that will be referenced in a project. Let's create a new project (CTRL+N) in Visual Studio. For the present example, choose "Visual C#" and "Winforms application" from the Templates menu. Now, from Visual Studio top menu go to "Project", "Add References". 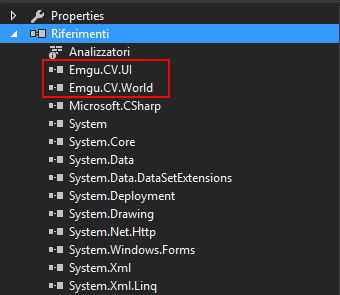 Select "Browse", and - going to the EmGu path created by the previously launched installer - select Emgu.CV.World.dll and Emgu.CV.UI.dll (fig.2). Confirming with OK button, Visual Studio will proceed to add those references to the project, as shown in fig.3. 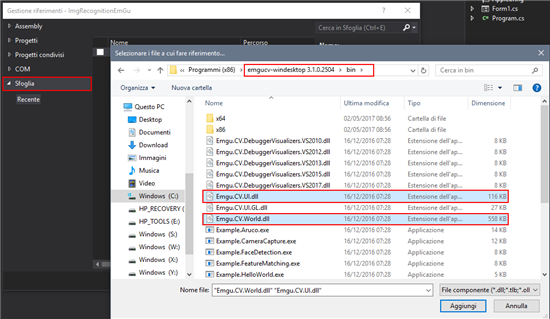 Important: to make the compiled solutions work, the x86 and x64 folders from \emgucv-windesktop 3.1.0.2504\binmust be copied into the compiled executable path. Otherwise, the programs which use Emgu won't be able to referencecvextern.dll, msvcp140.dll, opencv_ffmpeg310_64.dll, vcruntime140.dll, raising an exception and preventing them to run properly. As said in the Wikipedia page for Speeded up robust features (https://en.wikipedia.org/wiki/Speeded_up_robust_features ), "[...] is a patented local feature detector and descriptor. It can be used for tasks such as object recognition, image registration, classification or 3D reconstruction. It is partly inspired by the scale-invariant feature transform (SIFT) descriptor. The standard version of SURF is several times faster than SIFT and claimed by its authors to be more robust against different image transformations than SIFT. To detect interest points, SURF uses an integer approximation of the determinant of Hessian blob detector , which can be computed with 3 integer operations using a precomputed integral image. Its feature descriptor is based on the sum of the Haar wavelet response around the point of interest. These can also be computed with the aid of the integral image. SURF descriptors have been used to locate and recognize objects, people or faces, to reconstruct 3D scenes, to track objects and to extract points of interest." Imread method will read an image from a given path and load type (grayscale, color, and so on), returning a Mat object for further uses. We have two Mat variables from two different sources, i.e. 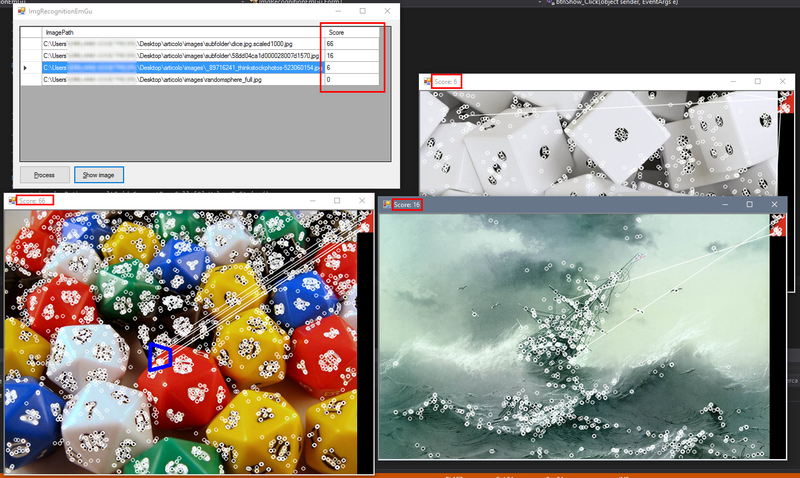 "box.png" and "box_in_scene.png" (both included into the sample folder). //  Copyright (C) 2004-2016 by EMGU Corporation. All rights reserved. /// Draw the model image and observed image, the matched features and homography projection. The core method is FindMatch(), used to discover similarities amongst the images, and populating arrays which will be used by the Draw() method to show them graphically. We'll not analyze in detail the above code here, but we will modify it in the following, to make it able not only to spot differences, but to tell the user how much of them are present, allowing the application to tell - starting from a list of images - what image suits best the detailed one. In order to analyze an arbitrary number of images, to detect the one which contains our model image, it is necessary to have a score of similarities for each analyzed image. The idea is simple: given a certain folder(s) containing images, and a small image to be localized, the program must process each one of them, determining a value which represents how many key points from the model image have been spotted into the cycled image. At the end of the loop, the image(s) that will have returned the higher values are more likely to be the results we expect (or, in other word, higher the score, higher are the chances our model is contained into those images). 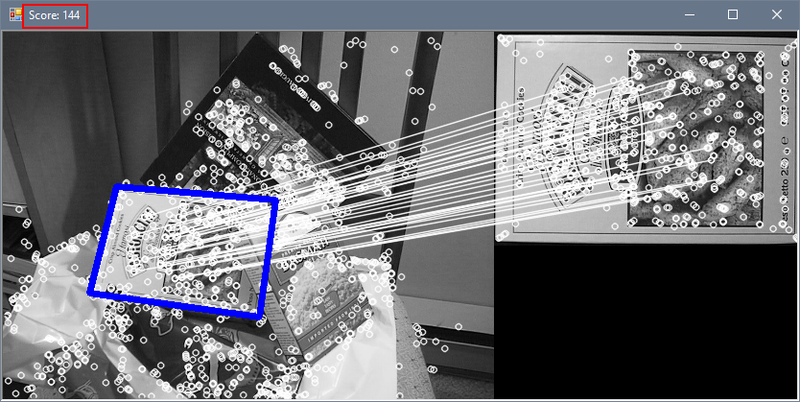 FindMatch() method could be customized to expose a count of matches found between images. Note: for the sake of speed upon accuracy, in the above code LinearIndexParams has been substituted by KdTreeIndexParams. Obviously, every method which calls FindMatch() must include the new score variable. So, Draw() method must be customized accordingly. In short, every time we execute Draw() method we must pass a long variable in which the score will be calculated, when it get passed to FindMatch() method. Please refer to the source code at the end of the article for further references. To check rapidly the score value for any image, a customized image viewer form can be created. At this point, calculating the score for a list of images becomes trivial. Let's assume we have a given directory, images, with its subfolder structure, each of which may contain images. What is needed now is to traverse the entire directory tree and execute a comparison for every file found. The calculated score can be saved in an apt memory structure, to be listed at the end of the process. A simple method, ProcessFolder(), will parse every single file of each directory in the structure, recursively. For each of them, it will call ProcessImage(), which is the heart of the process. ProcessImage() doesn't need to draw the resultant object, it can simply stop when the score is calculated, and that value (with the file name) is added to imgList. A button will start the process. At the end of it, the imgList is ordered by descendant score value, and used as DataSource for a DataGridView, to show the results of the process itself. 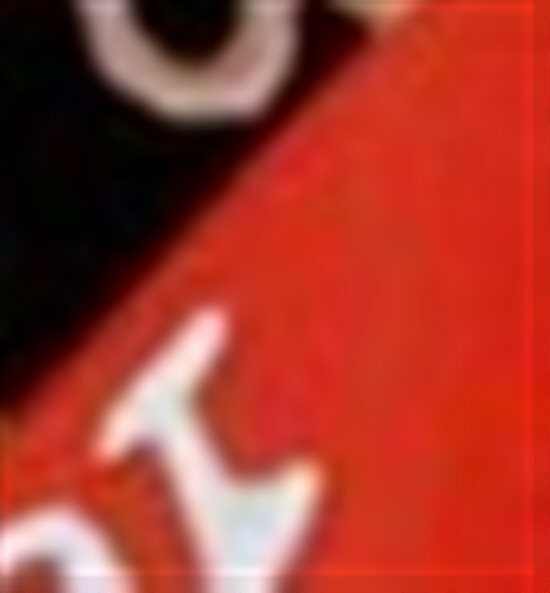 As it can be seen, the sample directories has been traversed, and for each found image, a score was calculated, comparing the searched image to the complete one. Please note, since those image are not grayscaled, but coming in colours, that load type was set accordingly (ImreadModes.Color). And we can see how the correct image has been spotted by the higher score of the list. The presented code must be considered valid in learning contexts only. A further implementation, to manage - for example - many thousands images in a single run, can be made by making the program asynchronous / multi-threaded, in order to better split resources and diminish elaboration time. 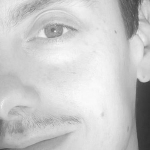 Working in IT since 2003 as Software Developer for Essetre Srl, a company in Northern Italy. I was awarded in 2014, 2015 and 2016 with Microsoft MVP, for Visual Studio and Development Technologies expertise. My technology interests and main skills are in .NET Framework, Visual Basic, Visual C# and SQL Server, but i'm proficient in PHP and MySQL also. Capturing motion from video using the Emgu CV library. I have downloaded the source code and downloaded 10 images, stored in one folder and a separate image same object as in one of the ten images in a different perspective and included the path in the code. 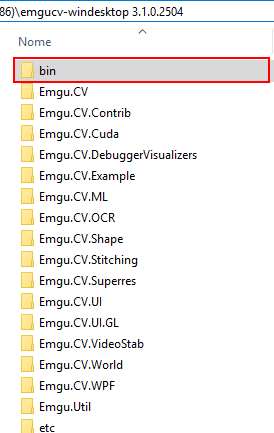 => The type initializer for 'Emgu.CV.CvInvoke' threw an exception. Thanks you for this sample, i voted 5. If you just put one image on the directory, it retuns a result, and coordinates. If you put several pictures with this picture , this picture will not return the same result and same coordinates ! Si tu aimes ce que tu fais , tu finis par réussir ! I found it super interesting, it helped a lot to understand the library. Thank you very much for the article! Thank you for your appreciation! Great tutorial with lots of images which help understand. Thanks!